A crew preparing for the shakedown hike at the Watchu Mountain Adventure weekend. Philmont crews are youth led. The eighteen months of the Watchu Experience provides the information and opportunities to train them for that responsibility and to make your crew into a smoothly functioning team. 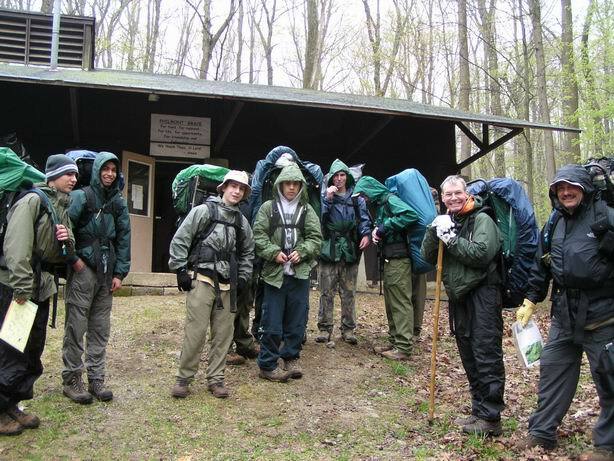 In particular, the Watchu Experience has partnered with Patriots’ Path Council to provide special team-building opportunities for both advisors and crews on the low COPE (Challenging Outdoor Personal Experience) course at Mount Allamuchy Scout Reservation and during a week-long canoe trek at Sabattis Adventure Camp. Use the links on this page to help develop your crew into a well-oiled team, including topics on leadership, training, shakedowns and other team-building items. The Sample Crew Development Calendar provides a suggested schedule of activities for preparing your crew. Tracking your crew's progress against the Crew Preparation Checklist will assure you have done everything necessary to prepare them.